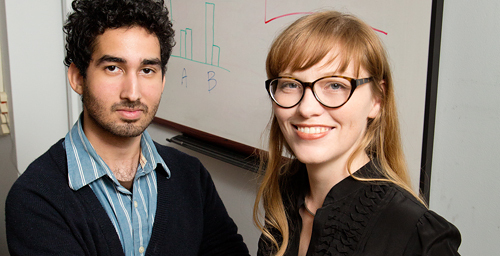 University of Illinois psychology professor Jesse Preston, right, and graduate student Ivan Hernandez found that people were less biased after reading political materials or criminal evidence in a hard-to-read font. CHAMPAIGN, lll. - Liberals and conservatives who are polarized on certain politically charged subjects become more moderate when reading political arguments in a difficult-to-read font, researchers report in a new study. Likewise, people with induced bias for or against a defendant in a mock trial are less likely to act on that bias if they have to struggle to read the evidence against him. VIEW VIDEO The study is the first to use difficult-to-read materials to disrupt what researchers call the "confirmation bias," the tendency to selectively see only arguments that support what you already believe, psychology professor Jesse Preston said. The new research, reported in the Journal of Experimental Social Psychology, is one of two studies to show that subtle manipulations that affect how people take in information can reduce political polarization. The other study, which explores attitudes toward a Muslim community center near the World Trade Center site, is described in a paper in the journal Social Psychological and Personality Science. 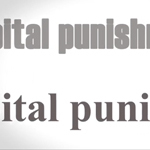 By asking participants to read an overtly political argument about capital punishment in a challenging font, the researchers sought to disrupt participants' usual attitudes to the subject, said graduate student Ivan Hernandez, who led the capital punishment/mock trial study with University of Illinois psychology professor Jesse Preston. In a separate experiment, people were shown documents that praised or criticized the behavior of a defendant in a mock trial before they saw the (rather sketchy) evidence against him. As expected, those who read an unflattering account of the defendant's character were much more likely to convict him than those who read a more complimentary report. The two sides were far apart on their assessment of the evidence. "But when people read a difficult-to-read summary of the evidence, then they became more moderate," Hernandez said. "Those with the positive impression suddenly thought maybe he could be guilty and gave more guilty verdicts than those who had read the evidence in a normal font. And the people who didn't like him started giving more not guilty verdicts relative to before." The study is the first to use difficult-to-read materials to disrupt what researchers call the "confirmation bias," the tendency to selectively see only arguments that support what you already believe, Preston said. And it is the first to show that the intervention can moderate both deeply held political beliefs as well as newly formed biases, she said. "Not only are people considering more the opposing point of view but they're also being more skeptical of their own because they're more critically engaging both sides of the argument," she said. "We showed that if we can slow people down, if we can make them stop relying on their gut reaction - that feeling that they already know what something says - it can make them more moderate; it can have them start doubting their initial beliefs and start seeing the other side of the argument a little bit more," Hernandez said.